Democratic New York Gov. Andrew Cuomo wasted no time linking Republican challenger Marc Molinaro to the policies of President Donald Trump in the only debate between the gubernatorial candidates before next month’s general election. Molinaro reiterated his criticism of Cuomo for his handling of the state’s economy, saying he let state spending increase. He also criticized his administration for corruption. Tuesday’s debate at the CBS Broadcast Center in New York City was to be broadcast at 7 p.m. on CBS affiliates around the state. It didn’t include the three third-party candidates: Libertarian Larry Sharpe, Green Party nominee Howie Hawkins and independent ex-Syracuse Mayor Stephanie Miner. New York Gov. 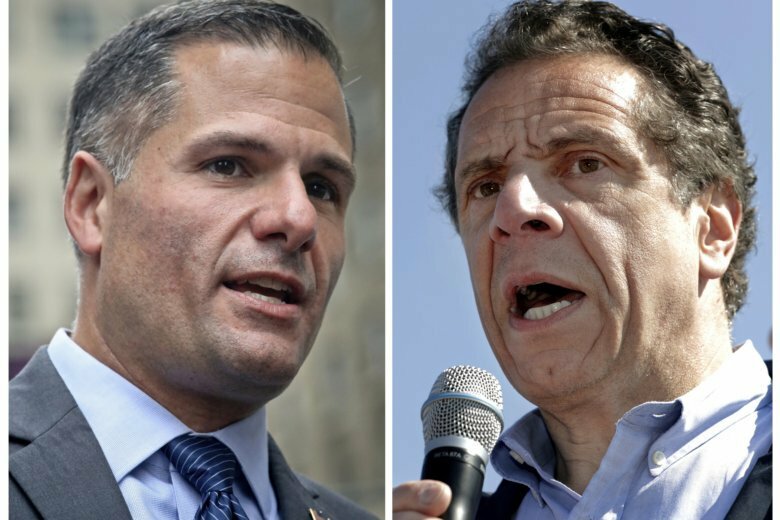 Andrew Cuomo and Republican challenger Marc Molinaro are poised to debate in their only showdown scheduled before next month’s election. Tuesday’s debate at the CBS Broadcast Center in New York City will be broadcast at 7 p.m. on CBS affiliates around the state. Upstate viewers should check local times. Cuomo, seeking a third term, is far ahead of Molinaro in the polls and in fundraising. Molinaro, the Dutchess County executive, has criticized Cuomo for his handling of the economy, taxes and political corruption. Cuomo has sought to link Molinaro to President Donald Trump, saying Republicans can’t be trusted to run the state. The debate won’t feature the three third-party candidates: Libertarian Larry Sharpe, Green Party nominee Howie Hawkins or ex-Syracuse Mayor Stephanie Miner, an independent.